Beaumaris Castle (Welsh: Castell Biwmares), in Beaumaris, Anglesey, Wales, was built as part of Edward I's campaign to conquer north Wales after 1282. Plans were probably first made to construct the castle in 1284, but this was delayed due to lack of funds and work only began in 1295 following the Madog ap Llywelyn uprising. A substantial workforce was employed in the initial years under the direction of James of St George. Edward's invasion of Scotland soon diverted funding from the project, however, and work stopped, only recommencing after an invasion scare in 1306. When work finally ceased around 1330 a total of £15,000 had been spent, a huge sum for the period, but the castle remained incomplete. Beaumaris Castle was taken by Welsh forces in 1403 during the rebellion of Owain Glyndŵr, but recaptured by royal forces in 1405. Following the outbreak of the English Civil War in 1642, the castle was held by forces loyal to Charles I, holding out until 1646 when it surrendered to the Parliamentary armies. Despite forming part of a local royalist rebellion in 1648, the castle escaped slighting and was garrisoned by Parliament, but fell into ruin around 1660, eventually forming part of a stately home and park in the 19th century. In the 21st century, the ruined castle is still a tourist attraction. Historian Arnold Taylor described Beaumaris Castle as Britain's "most perfect example of symmetrical concentric planning". The fortification is built of local stone, with a moated outer ward guarded by twelve towers and two gatehouses, overlooked by an inner ward with two large, D-shaped gatehouses and six massive towers. The inner ward was designed to contain ranges of domestic buildings and accommodation able to support two major households. The south gate could be reached by ship, allowing the castle to be directly supplied by sea. UNESCO considers Beaumaris to be one of "the finest examples of late 13th century and early 14th century military architecture in Europe", and it is classed as a World Heritage site. The kings of England and the Welsh princes had vied for control of North Wales since the 1070s and the conflict had been renewed during the 13th century, leading to Edward I intervening in North Wales for the second time during his reign in 1282. Edward invaded with a huge army, pushing north from Carmarthen and westwards from Montgomery and Chester. Edward decided to permanently colonise North Wales and provisions for its governance were set out in the Statute of Rhuddlan, enacted on 3 March 1284. 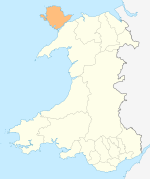 Wales was divided into counties and shires, emulating how England was governed, with three new shires created in the north-west, Caernarfon, Merioneth and Anglesey. New towns with protective castles were established at Caernarfon and Harlech, the administrative centres of the first two shires, with another castle and walled town built in nearby Conwy, and plans were probably made to establish a similar castle and settlement near the town of Llanfaes on Anglesey. Llanfaes was the wealthiest borough in Wales and largest in terms of population, an important trading port and on the preferred route from North Wales to Ireland. The huge cost of the building the other castles, however, meant that the Llanfaes project had to be postponed. In 1294 Madog ap Llywelyn rebelled against English rule. The revolt was bloody and amongst the casualties was Roger de Pulesdon, the sheriff of Anglesey. Edward suppressed the rebellion over the winter and once Anglesey was reoccupied in April 1295 he immediately began to progress the delayed plans to fortify the area. The chosen site was called Beaumaris, meaning "fair marsh", whose name derives from the Norman-French Beau Mareys, and in Latin the castle was termed de Bello Marisco. This was about 1 mile (1.6 km) from Llanfaes and the decision was therefore taken to move the Welsh population of Llanfaes some 12 miles (19 km) south-west, where a settlement by the name of Newborough was created for them. The deportation of the local Welsh opened the way for the construction of a prosperous English town, protected by a substantial castle. The castle was positioned in one corner of the town, following a similar town plan to that in the town of Conwy, although in Beaumaris no town walls were constructed at first, despite some foundations being laid. Work began in the summer of 1295, overseen by Master James of St George. James had been appointed the "master of the king's works in Wales", reflecting the responsibility he had in their construction and design. From 1295 onwards, Beaumaris became his primary responsibility and more frequently he was given the title "magister operacionum de Bello Marisco". The work was recorded in considerable detail on the pipe rolls, the continuous records of medieval royal expenditure, and, as a result, the early stages of construction at Beaumaris are relatively well understood for the period. The construction slowed during 1296, although debts continued to build up, and work dropped off further the following year, stopping entirely by 1300, by when around £11,000 had been spent. The halt was primarily the result of Edward's new wars in Scotland, which had begun to consume his attention and financial resources, but it left the castle only partially complete: the inner walls and towers were only a fraction of their proper height and the north and north-west sides lacked outer defences altogether. In 1306 Edward became concerned about a possible Scottish invasion of North Wales, but the unfinished castle had already fallen into a poor state of repair. Work recommenced on completing the outer defences, first under James' direction and then, after his death in 1309, Master Nicolas de Derneford. This work finally halted in 1330 with the castle still not built to its intended height; by the end of the project, £15,000 had been spent, a colossal sum for the period. A royal survey in 1343 suggested that at least a further £684 would be needed to complete the castle, but this was never invested. In 1400 a revolt broke out in North Wales against English rule, led by Owain Glyndŵr. Beaumaris Castle was placed under siege and captured by the rebels in 1403, being retaken by royal forces in 1405. The castle was ill-maintained and fell into disrepair and by 1534, when Roland de Velville was the castle constable, rain was leaking into most of the rooms. In 1539 a report complained that it was protected by an arsenal of only eight or ten small guns and forty bows, which the castle's new constable, Richard Bulkeley, considered to be completely inadequate for protecting the fortress against a potential Scottish attack. Matters worsened and by 1609 the castle was classed as "utterlie decayed". The English Civil War broke out in 1642 between the Royalist supporters of Charles I and the supporters of Parliament. Beaumaris Castle was a strategic location in the war, as it controlled part of the route between the king's bases in Ireland and his operations in England. Thomas Bulkeley, whose family had been involved in the management of the castle for several centuries, held Beaumaris for the king and may have spent around £3,000 improving its defences. [nb 2] By 1646, however, Parliament had defeated the royal armies and the castle was surrendered by Colonel Richard Bulkeley in June. Anglesey revolted against Parliament again in 1648, and Beaumaris was briefly reoccupied by royalist forces, surrendering for a second time in October that year. After the war many castles were slighted, damaged to put them beyond military use, but Parliament was concerned about the threat of a royalist invasion from Scotland and Beaumaris was spared. Colonel John Jones became the castle governor and a garrison was installed inside, at a cost of £1,703 a year. When Charles II returned to the throne in 1660 and restored the Bulkeley family as castle constables, Beaumaris appears to have been stripped of its valuable lead and remaining resources, including the roofs. Lord Thomas Bulkeley bought the castle from the Crown in 1807 for £735, incorporating it into the park that surrounded his local residence, Baron Hill. [nb 3] By then the castles of North Wales had become attractive locations for visiting painters and travellers, who considered the ivy-clad ruins romantic. Although not as popular as other sites in the region, Beaumaris formed part of this trend and was visited by the future Queen Victoria in 1832 for an Eisteddfod festival and it was painted by J. M. W. Turner in 1835. Some of the castle's stones may have been reused in 1829 to build the nearby Beaumaris Gaol. In 1925 Richard Williams-Bulkeley gave the castle to the Commissioners of Works, who then carried out a large scale restoration programme, stripping back the vegetation, digging out the moat and repairing the stonework. In 1950 the castle, considered by the authorities to be "one of the outstanding Edwardian medieval castles of Wales", was designated as a Grade I listed building – the highest grade of listing, protecting buildings of "exceptional, usually national, interest". Beaumaris was declared part of the Castles and Town Walls of King Edward in Gwynedd World Heritage site in 1986, UNESCO considering it one of "the finest examples of late 13th century and early 14th century military architecture in Europe". In the 21st century Beaumaris Castle is managed by Cadw, the Welsh Assembly Government's agency for historic monuments, as a tourist attraction, with 75,000 visitors during the 2007–08 financial year. The castle requires ongoing maintenance and repairs cost £58,000 over the 2002–03 financial year. Beaumaris Castle was never fully built, but had it been completed it would probably have closely resembled Harlech Castle. Both castles are concentric in plan, with walls within walls, although Beaumaris is the more regular in design. Historian Arnold Taylor described Beaumaris as Britain's "most perfect example of symmetrical concentric planning" and for many years the castle was regarded as the pinnacle of military engineering during Edward I's reign. This evolutionary interpretation is now disputed by historians: Beaumaris was as much a royal palace and symbol of English power as it was a straightforward defensive fortification. Nonetheless, the castle is praised by UNESCO as a "unique artistic achievement" for the way in which it combines "characteristic 13th century double-wall structures with a central plan" and for the beauty of its "proportions and masonry". Beaumaris Castle was built at around sea-level on top of the till and other sediments that form the local coastline, and was constructed from local Anglesey stone from within 10 miles (16 km) of the site, with some stones brought along the coast by ship, for example from the limestone quarries at Penmon. The stone was a mixture of limestone, sandstone and green schists, which was used fairly randomly within the walls and towers; the use of schists ceased after the pause in the building work in 1298 and as a result is limited to the lower levels of the walls. The castle design formed an inner and an outer ward, surrounded in turn by a moat, now partially filled. The main entrance to the castle was the Gate next the Sea, next to the castle's tidal dock that allowed it to be supplied directly by sea. The dock was protected by a wall later named the Gunners Walk and a firing platform that may have housed a trebuchet siege engine during the medieval period. The Gate next the Sea led into an outer barbican, protected by a drawbridge, arrow slits and murder-holes, leading on into the outer ward. The outer ward consisted of an eight-sided curtain wall with twelve turrets enclosing an area approximately 60 feet (18 m) across; one gateway led out to the Gate next the Sea, the other, the Llanfaes Gate, led out to the north side of the castle. The defences were originally equipped with around 300 firing positions for archers, including 164 arrow slits, although 64 of the slits close to the ground level have since been blocked in to prevent them being exploited by attackers, either in the early 15th century or during the Civil War. The walls of the inner ward were more substantial than those of the outer ward, 36-foot (11 m) high and 15.5-foot (4.7 m) thick, with huge towers and two large gatehouses, enclosing a 0.75-acre (0.30 ha) area. The inner ward was intended to hold the accommodation and other domestic buildings of the castle, with ranges of buildings stretching along the west and east sides of the ward; some of the remains of the fireplaces for these buildings can still be seen in the stonework. It is uncertain if these ranges were actually ever built or if they were constructed but later demolished after the Civil War. If finished, the castle would have been able to host two substantial households and their followers, for example the king and queen, or the king, queen and a prince and his own wife. The D-shaped north gatehouse in the inner ward was intended to be two storeys high, with two sets of five, large windows, of which only one floor was actually completed. It would have included a large hall on the first floor, around 70 feet (21 m) by 25 feet (7.6 m) across, divided into two with separate fireplaces for heating. The south gatehouse was designed to be a replica of that on the north side, but building work progressed even less far before finishing in 1330. Some of the stonework may since have been removed from the gatehouse, reducing its height even further. The walls of the inner ward contain extensive first floor passageways, similar to those at Caernarfon Castle. These were intended to allow members of the castle to move between the towers, accessing the guardrooms, sleeping chambers and the castle latrines. The latrines were designed to be drained by a special system using the water from the moat, but the system does not appear to have worked well in practice. The six towers were intended to be three storeys high and contained fireplaces. The castle chapel was built into one of the towers and would have been used by the king and his family, rather than the wider garrison. ^ It is impossible to accurately compare medieval and modern prices or incomes. For comparison, a typical baron of the period enjoyed an average annual income of around £700. The wage costs at Harlech of £270 a week were around a third of their annual income, the total cost of the castle at £15,000 around twenty times their annual income. ^ It is difficult to accurately compare 17th century and modern prices or incomes. £3,000 could equate to between £406,000 to £86,000,000 in 2011 terms, depending on the measure used. For comparison, Henry Somerset, one of the richest men in England at the time, had an annual income of around £20,000. ^ £735 in 1807 could equate to between £56,000 to £2,600,000 in 2011 terms, depending on the measure used. Wikimedia Commons has media related to Beaumaris Castle. Harlech Castle, located in Harlech, Gwynedd, Wales, is a medieval fortification, constructed atop a spur of rock close to the Irish Sea. It was built by Edward I during his invasion of Wales between 1282 and 1289 at the relatively modest cost of £8,190. Over the next few centuries, the castle played an important part in several wars, withstanding the siege of Madog ap Llywelyn between 1294–95, but falling to Owain Glyndŵr in 1404. It then became Glyndŵr's residence and military headquarters for the remainder of the uprising until being recaptured by English forces in 1409. During the 15th century Wars of the Roses, Harlech was held by the Lancastrians for seven years, before Yorkist troops forced its surrender in 1468, a siege memorialised in the song Men of Harlech. Following the outbreak of the English Civil War in 1642, the castle was held by forces loyal to Charles I, holding out until 1647 when it became the last fortification to surrender to the Parliamentary armies. In the 21st century the ruined castle is managed by Cadw, the Welsh Government's historic environment service, as a tourist attraction. Criccieth Castle is a native Welsh castle situated on the headland between two beaches in Criccieth, Gwynedd, in North Wales, on a rocky peninsula overlooking Tremadog Bay. It was built by Llywelyn the Great of the kingdom of Gwynedd but it was heavily modified following its capture by English forces of Edward I in the late 13th century. Beaumaris is a community, and the former county town, of Anglesey, Wales, at the eastern entrance to the Menai Strait, the tidal waterway separating Anglesey from the coast of North Wales. At the 2011 census, its population was 1,938. A concentric castle is a castle with two or more concentric curtain walls, such that the inner wall is higher than the outer and can be defended from it. The word concentric does not imply that these castles were circular; in fact, if taken too literally, the term is quite misleading. The layout was square where the terrain permitted, or an irregular polygon where curtain walls of a spur castle followed the contours of a hill. Denbigh Castle and town walls were a set of fortifications built to control the lordship of Denbigh after the conquest of Wales by King Edward I in 1282. The King granted the lands to Henry de Lacy, the Earl of Lincoln, who began to build a new walled town, colonised by immigrants from England, protected by a substantial castle and surrounded by deer parks for hunting. The work had not been completed by 1294, when the Welsh temporarily seized the castle during the Madog ap Llywelyn revolt. The defences continued to be improved, although the castle was not completely finished by the time of Henry's death in 1311. Rhuddlan Castle is a castle located in Rhuddlan, Denbighshire, Wales. It was erected by Edward I in 1277, following the First Welsh War. Llanfaes is a small village on the island of Anglesey, Wales, located on the shore of the eastern entrance to the Menai Strait, the tidal waterway separating Anglesey from the north Wales coast. Its natural harbour made it an important medieval port and it was briefly the capital of the kingdom of Gwynedd. Following Prince Madoc's Rebellion, Edward I removed the Welsh population from the town and rebuilt the port a mile to the south at Beaumaris. Caernarfon Castle, often anglicized as Carnarvon Castle, is a medieval fortress in Caernarfon, Gwynedd, north-west Wales cared for by Cadw, the Welsh Government's historic environment service. It was a motte-and-bailey castle in the town of Caernarfon from the late 11th century until 1283 when King Edward I of England began replacing it with the current stone structure. The Edwardian town and castle acted as the administrative centre of north Wales and as a result the defences were built on a grand scale. There was a deliberate link with Caernarfon's Roman past and the Roman fort of Segontium is nearby. Conwy's town walls are a medieval defensive structure around the town of Conwy in North Wales. The walls were constructed between 1283 and 1287 after the foundation of Conwy by Edward I, and were designed to form an integrated system of defence alongside Conwy Castle. The walls are 1.3 km (0.81 mi) long and include 21 towers and three gatehouses. The project was completed using large quantities of labourers brought in from England; the cost of building the castle and walls together came to around £15,000, a huge sum for the period. The walls were slightly damaged during the rebellion of Owain Glyndŵr in 1401, but political changes in the 16th century reduced the need to maintain such defences around the town. The fortifications were treated sympathetically during the development of the road and railway systems in Conwy during the 19th century and survived largely intact into the modern period. Today the walls form part of the UNESCO world heritage site administered by Cadw. Historians Oliver Creighton and Robert Higham describe the defences as "one of the most impressive walled circuits" in Europe. Caernarfon's town walls are a medieval defensive structure around the town of Caernarfon in North Wales. The walls were constructed between 1283 and 1292 after the foundation of Caernarfon by Edward I, alongside the adjacent castle. The walls are 734 m (2,408 ft) long and include eight towers and two medieval gatehouses. The project was completed using large numbers of labourers brought in from England; the cost of building the walls came to around £3,500, a large sum for the period. The walls were significantly damaged during the rebellion of Madog ap Llywelyn in 1294, and had to be repaired at considerable expense. Political changes in the 16th century reduced the need to maintain such defences around the town. Today the walls form part of the UNESCO world heritage site administered by Cadw. Archaeologists Oliver Creighton and Robert Higham describe the defences as "a remarkably intact walled circuit". Beaumaris's town walls were a fifteenth-century defensive structure built around the town of Beaumaris in Wales. In the United Kingdom, the term listed building refers to a building or other structure officially designated as being of special architectural, historical, or cultural significance; Grade I structures are those considered to be "buildings of exceptional interest". Listing was begun by a provision in the Town and Country Planning Act 1947. Once listed, strict limitations are imposed on the modifications allowed to a building's structure or fittings. In Wales, the authority for listing under the Planning Act 1990 rests with Cadw. St Mary and St Nicholas Church, Beaumaris, is a fourteenth century Grade I listed building in Beaumaris, Anglesey, Wales. Llanfaes Friary was a Franciscan friary in the now vanished medieval town of Llanfaes, close to what is now Beaumaris, in south east Anglesey, Wales. It was founded around 1237 in memory of Joan, wife of Llywelyn ab Iorwerth. The Friary survived the depopulation of the town, but was dissolved in 1538 and most of the buildings dismantled soon afterwards. The land became an estate on which, in 1623, Rowland Whyte built a house which he called Friars. It became one of the many properties of the Bulkeley family, and was substantially rebuilt in 1866. By the 20th century the house and grounds were owned by James Hartley Burton. In 1939 they were requisitioned for wartime use, adapting and repairing flying boats, by Saunders-Roe, who continued after the war with a wide variety of light engineering activities. The industrial uses finally came to an end in the late 1990s. An archaeological dig on the site in 1991 identified substantial buried remains of the friary church and other monastic buildings. The site is a Scheduled monument.